2013 NBA Finals: San Antonio’s “old” team has a brighter future than Miami’s ersatz San Antonio’s “Old” Team Has a Brighter Future than Miami’s Ersatz Dynasty dynasty. The Heat prevailed in Game 7, but the Spurs have the brighter future. 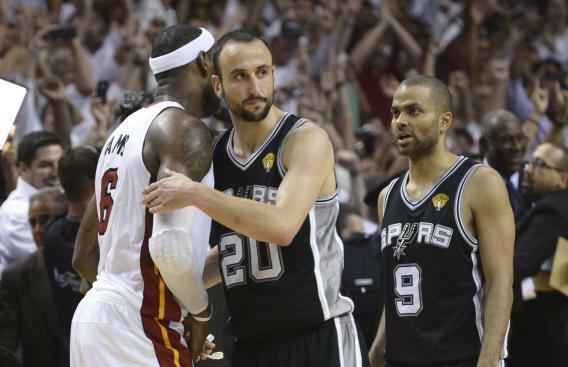 Manu Ginobili of the San Antonio Spurs embraces LeBron James (L) of the Miami Heat as the Spurs’ Tony Parker looks on after the Heat’s Game 7 win in the 2013 NBA Finals. In the wake of Thursday night’s grueling Game 7 defeat at the hands of the Miami Heat, it’s tempting to view this 2013 playoff run as the last gasp of a fading San Antonio Spurs dynasty. But while this year’s Spurs team featured the same key faces—Tim Duncan, Manu Ginobili, Tony Parker, Gregg Popovich—as the team that won a championship a decade ago, it’s in fact a very different team and a franchise with an extremely bright future. The Heat are based, fundamentally, on the brilliance of LeBron James and the lie that he’s a roughly equal talent to his friends Dwyane Wade and Chris Bosh. As such, their dynasty-in-the-works is inherently fragile—just one spat or contract renegotiation from falling apart. The Spurs’ success, by contrast, stems from top-to-bottom organizational competence and there’s every reason to think they’ll be playing deep into the playoffs for years to come. While in retrospect the 2003 Spurs championship team—the first to feature the Big 3 of Duncan, Ginobili, and Parker—looks like the beginning of an era, at the time it was more like David Robinson’s swan song. The emergence of the Parker–Ginobili backcourt as a replacement for the Admiral and Stephen Jackson’s creativity on the wing was an example of successful rebuilding on the fly. And what we see emerging on this year’s Spurs team is a repeat performance. Next season’s outlook for the Heat is bright in the sense that any team featuring James—especially in the weak Eastern Conference—is bound to be a contender. But Miami will have to spend the summer contemplating the 2014 free agency of James, Bosh, and Wade; the declining state of Wade’s knee; its aging cast of role players; a perilous lack of size; and an absence of cap flexibility with which to address these various problems. By contrast, behind the aging Duncan and Ginobili the Spurs are now deep with young talent. Danny Green disappointed in Game 7, but throughout the playoffs established himself as a sharpshooting force. (And even before the playoffs, Green ranked 10th in NBA history in 3-point shooting percentage.) Kawhi Leonard, who averaged 15 points and 11 rebounds per game in the Finals while guarding James, is only 21. Parker and Tiago Splitter are both young enough to stay effective as the team’s young wings mature and improve. Young guards Nando de Colo and Patty Mills have both been effective in limited minutes this year, and the odds that at least one of them will have the skills to step up into a rotation role seem good. And unlike other teams, the Spurs have a farm system. San Antonio’s enduring success stems from a combination of canny player evaluation and patience. Since the team is good, and since everyone has confidence in each other, there’s little pressure to make panicky moves. San Antonio can afford to draft guys like Splitter and bring him to the states years later as a prime-age rookie. Not coincidentally, lurking on the Spurs bench you might see a 26-year-old Australian rookie big man named Aron Baynes. He’s barely played this season and in fact only joined the team in January. But earlier in the year he played in the Euroleague, the highest level of European basketball, for Slovenia’s Union Olimpija. He scored 14 points and 10 rebounds a game in 26 minutes while making 59 percent of his field goals. He also started one playoff game this year, guarding a guy named Dwight Howard. Howard scored 7 points in the game and committed five turnovers, before getting ejected in the third quarter for excessive arguing. Am I promising you that Baynes is going to be an NBA star? No. But nobody should be surprised at this point if the Spurs manage to find useful mid-20s players in Europe. And if Baynes doesn’t work out, there are eight more guys in Europe whom the Spurs own the rights to, and I’d be very surprised if one or two don’t turn out to be solid NBA talents. Last but by no means least, the Spurs have that rarest of qualities for a championship contender—salary cap space. While their conference rivals in Memphis and Oklahoma City have been dumping salary to avoid the luxury tax, the Spurs in principle could sign a free agent to a max contract this summer by dumping Splitter and Boris Diaw and persuading Ginobili to return for the veterans’ minimum. More plausibly, this means they have the luxury of shopping the free agent market prudently. If there are any good values to be had, general manager R.C. Buford has the money to make the deal. But he’s also under no pressure to make hasty moves. The team could simply preserve cap space and be in a good position to make an opportunistic mid-season trade when, inevitably, some other squad finds itself wanting to dump salary. This is a staggering management achievement, whose only real precedent is—not coincidentally—the 2003 Spurs, a team that managed to win a ring and have the salary cap space to make a serious run at signing Jason Kidd. Repeating that performance would have been a beautiful thing, and it almost happened. If a few balls had bounced another way, San Antonio would be victorious and Miami’s ersatz dynasty would be on the way to dissolution. Victory ensures that the Heat superfriends will stay together for at least one more year, but even in defeat the more fundamentally sound Spurs juggernaut is poised to roll forward and keep contending for a long to come.